A few other collectors began showing up in the late afternoon. Tom French and Brad Wilson set up a table with a few common keys and lots of books. UGLIEST bug I have ever seen for sale for $10. 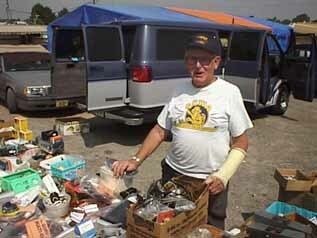 By midday, well over a dozen serious collectors and another dozen wanna-be's were prowling the rows asking every vendor whether they had any keys for sale. One man answered my inquiry by saying "HEY ! What's going ON here ??? You are at least the sixth person who has asked me whether I have any keys ???!!!" 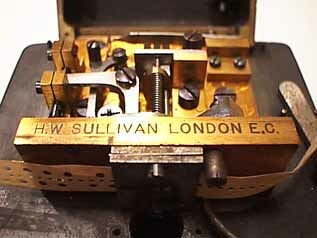 The tape punch was made by H. W. Sullivan... London, E.C. 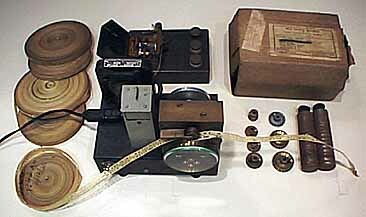 The three keys punch dots, dashes, and spaces into the paper tape. 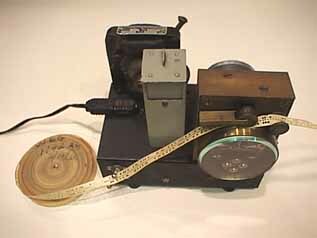 The high speed reader is driven by an electric motor with a belt-drive to the reader mechanism. The speed is changed by selecting from the 10 different sized pulleys. 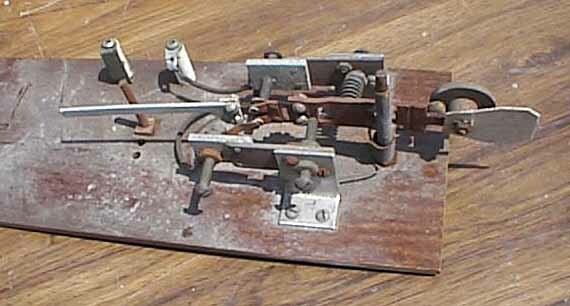 They are contained in a box from RCA VICTOR DIVISION of Radio Corporation of America. 415 S. Fifth Street., Harrison, NJ addressed to: Lester C. Barlow, R. E. USNR. Class 11-43A, Radio Materiel School, Naval Reseach Labs, Washington, D.C. postmarked August 27, 1943. 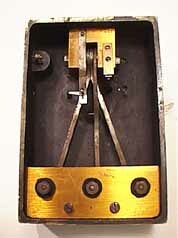 The electric motor driven tape reader mechanism. 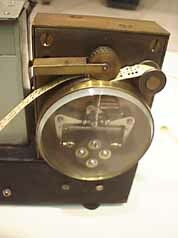 Closeup of the tape reader mechanism. 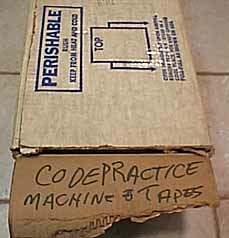 The British manual tape punch. 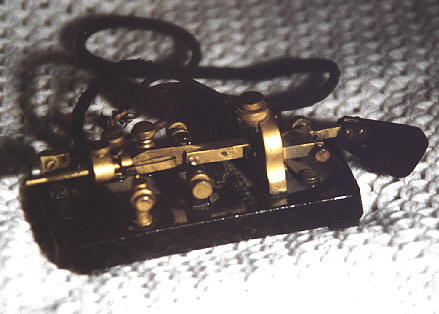 Closeup of the punch mechanism of the manual tape punch. 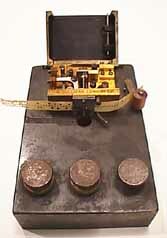 The bottom of the British tape punch. 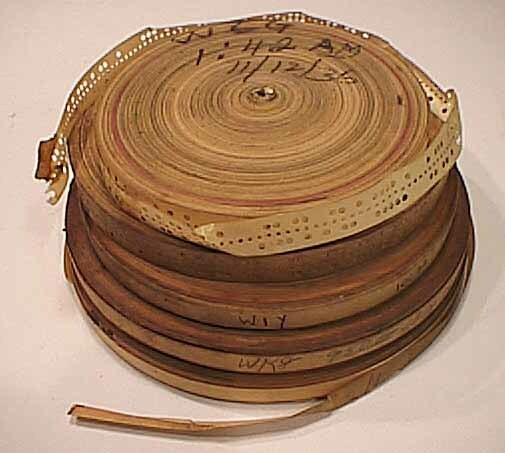 The rolls of punched tape. Despite furious searching and constant badgering of new set-ups, no unusual or interesting keys showed up... In fact, there were less keys for sale than there were collectors. COPE bug. It was not for sale, of course, but it was nice to see such a rare key in such a vacuum of other keys. Probably out of pure frustration, a few collectors bought keys from other collectors and one even bought Joel's "Ugliest key" (probably to enter into the "Ugliest-Key-at-Dayton" Contest).